This is one seriously twisted bracelet... but in a good way! I’ve been hanging out at Auntie’s Beads again and found this wonderful bracelet to share. Although video instructor Karla Schafer, provides clear instruction on how to make it, I wanted to create instructions here in print for those who work better with written steps. You can view Karla’s video at Auntie's Beads & Supplies. On the home page at Auntie’s Beads, search for “Spiral Rope Stitch video”. Like my Woven Crystal Bracelet, this one only requires beads, a clasp, and a needle and thread. The crystal beads twist around the bracelet to create the interesting spiral design. step 1 -Thread a big eye needle with 1 yard of beading thread. Although this project requires two yards, working with that length can be a challenge to repeatedly pass through so many beads. I will offer instruction on how to connect another yard of thread below. step 2 - Pass the needle through a stop bead which is essentially a bead that is meant to stop your work from slipping off at the end of the thread. To add a stop bead, use any bead (it will not be part of the finished bracelet). Pass the needle through it leaving a 12” tail on the end. Pass the needle through it again going in the same direction. step 3 - Add to the needle 5 garnet beads, 1 crystal bead, and 1 more garnet bead. 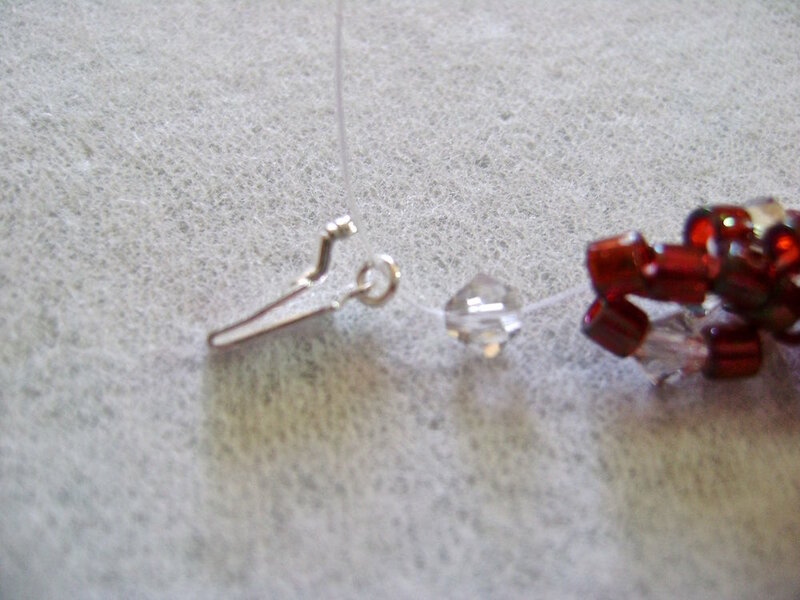 step 4 - Pass the needle through beads 1, 2, 3, and 4.
step 5 - Pull tightly on the thread to create a Side Set, which consists of 2 garnet beads (# 5 & 6) flanking a crystal bead. The Side Set will create the outer spiral look of the bracelet and curve around the center of the work. step 6 - Add to the needle 2 garnet beads, 1 crystal bead, and one more garnet bead (# 7, 8 & 9). step 7 - Pass the needle through beads # 2, 3, 4, and 7 to create another side set. Each time you create a side set you are picking up the last three beads from the previous work plus the first new garnet bead you just added. If you have any confusion, just remember you never go back through the beads in the side set. Pull tightly on the thread. Continue the bracelet using steps 6 and 7 until your bracelet is the length you need. Woven bracelets use a half hitch knot technique to end the work and also to finish with one length of thread and start another during the work. The technique calls for passing the needle through beads, making a knot, and passing back through the beads again. This is done several times with several sets of beads to prevent the tail end from becoming unravelled over time. When you have about 6 inches of thread remaining on your needle, you should tie off your work so you can add another yard and continue your bracelet. You will not be tying the two threads together. To tie off your work, first make note of the last bead on the string. It’s important to recognize this bead as this is where you will resume beading on the new length of thread. Create a half hitch knot between the last bead of your work and one next to it. Knots should be hidden between two beads. Once you’ve made the knot, go back through two beads and create another knot. Do this several times working in the direction of the stop bead for at least 1 1/2”. When finished, don’t cut off the excess. Remove the needle and attach the new yard of thread. Add one more crystal bead to the thread. Run the needle through one end of the clasp, then back through the crystal again, followed by two garnet beads. Tie a half hitch knot then return the needle through the beads it just came from, ending at the clasp. Go through the clasp again and up through the crystal, two garnet beads, and another half hitch knot. This will give the clasp a double secure connection to the bracelet. Pass the needle through two more garnet beads moving away from the clasp. Make another knot. Continue passing through beads and knotting several times to guarantee the thread won’t unravel. Snip off all excess thread when you’re done. Finish the other end of the bracelet by removing the stop bead, attaching the clasp and repeating the Finishing steps.